I was out hiking on Sunday at Proud Lake State Recreation Area. The sun was out, and it wasn’t too windy, so, really, how could I not go out and do at least a little hiking, right? We’ve had a total about about six feet of snow so far this winter, with nearly three feet of accumulation still on the ground. Normally, that’d make for some rough hiking conditions, but not on Sunday. Instead, through luck or planning, I don’t know, but the trails were nearly perfect. 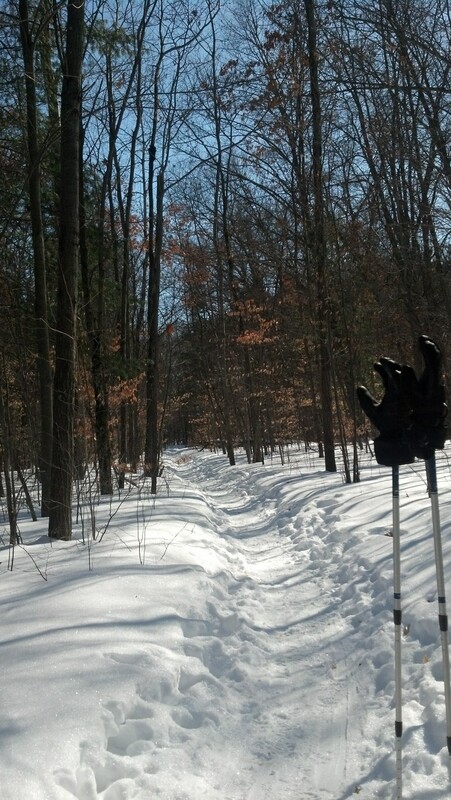 The trails themselves were hard packed and smooth for a width of 12″ – 18″. The surface was hard, but not icy at all. 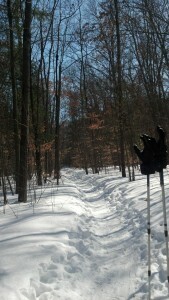 Hard enough to walk on, but still smooth and boot-divot-free enough to also make for perfect cross-country ski trails. Unlike normal cross-country ski trails, though, they didn’t have that annoying double ridge with the ankle-twisting canyon in the middle that so many of those trails tend to pick up. I suspect it was the work of snowshoers. Just don’t step off to the side. There’s a couple feet of loose snow over there just off that packed down trail. Although there’s still plenty of winter left, there is a light at the end of the tunnel for us lovers of spring. It’s warming up a bit, even above freezing here, and the days are getting noticeably longer. Won’t be long before all that white is replaced with green. Before that happens, though, don’t forget to check out icebergs on all the rivers and streams that’ll be melting soon. Probably get some really nice, beautiful ice dams building up here and there, too, on the narrow spots and sharp turns in the rivers. It’s 2014 and it looks like we’re off to a cold start. Here in Michigan, we used to get snow like this back around the last ice age (say anytime before about 1985 or so), but we never had so many sub-zero days. I think everyone’s looking forward to spring, except the people who love winter. Snow and ice will make the trail seem about twice as long as usual. If you’d normally hike 5 miles, stick to 2 or 3. If you’d normally hike 10 miles, might want to plan for 5. You probably won’t feel thirsty as often, but you still need to drink just as much water. In cold weather, you actually have to think about drinking enough water. Remember, you should probably be drinking at least a half liter per hour and stopping to “water a tree” every hour or two. Dress in layers. Everyone says, this, but it doesn’t always work. I know. I usually want to remove the bottom layer, not the outer, windproof one. If a lot of those layers have zippers, though, you can open and close jackets and vents quickly and easily. Open up when you start to move, before you get hot, and close them when you stop, before you get cold. Breaking trail is hard on fresh snow. Unless it’s a popular cross-country ski trail, there won’t be many people there, anyway, so it may be a great time to hit the more popular trails. A well-packed trail is much easier to hike. Think of the difference between walking on a well-packed gravel trail compared to trudging through deep, dry sand. Bring some extra food. You’ll be burning a lot of extra calories, both due to the trail and also due to the cold. Make sure your emergency kit is stocked up, including a survival blanket and chemical hand warmers for everyone in your group. Don’t be afraid to break out the hand warmers – they’re cheap, but worth it.